The Great Transition: The Emergence of Jewish Culture in the Middle Ages Is It Good for the Jews and Why Does the NYT Purport to Be the Arbiter? Prof. Penkower explored the depictions of the Ten Commandments in two paintings by Rembrandt. 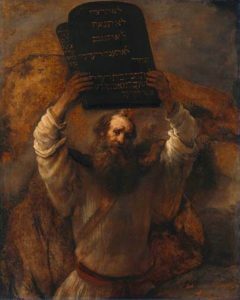 In both paintings, Rembrandt painted five commandments on each tablet in accordance with the tradition of the Midrash. Penkower noted that in one painting Rembrandt centered the five commandments on the second tablet. He suggested that this reflects the way the commandments are divided in the Masoretic text, with closed portions between them. Penkower further suggested that Menasseh ben Israel, the well-known Portugese rabbi and author, prepared a prototype of the Ten Commandments for Rembrandt to copy in his paintings. To support this theory, Penkower marshalled two other instances of collaboration between Menasseh ben Israel and Rembrandt. In his painting of Daniel’s “writing on the wall,” Rembrandt follows Menasseh’s understanding that the words were written vertically. Menasseh ben Israel’s book Even Yikarah also features four engravings by Rembrandt. Penkower then surveyed the depiction of the tablets in Christian art. The tablets are sometimes depicted as a scroll, as rectangular, or, quite often, as rectangular with rounded tops. While rectangular tablets seems to fit best with the Biblical depiction, perhaps the scroll represents the Midrash that the tablets could be rolled up. Penkower suggested that rounded shape is a reflection of the shape of the diptychs that were used for writing in ancient times. In Jewish art, the tablets are either depicted as rectangular or with rounded tops. Penkower suggests that the latter mimics the Christian depiction. Sometimes the tablets are depicted as a Torah scroll, loosely reminiscent of the verse “I will give to you tablets of stone and the Torah..” (Exodus 24:12).